This sleep sack is just the right size for bringing a preemie home from the hospital. 1. Read through all instructions before beginning. 2. When joining with a slip stitch, pull the stitch tight until it almost disappears. 3. I used Red Heart Sport. 4. Actual measurements 13 inch circumference and 12 inch length. Rounds 9-28: Repeat rounds 7 and 8. I've been looking everywhere for preemie size & pattern for a sleep sack, TK U! 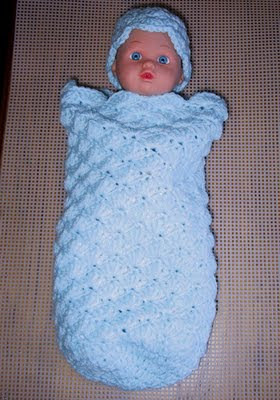 Thank you for posting such a precious preemie pattern. I am in a church organization that crochets and knits items for charity. Your pattern will enable us to extend our outreach. Thank you.